This year, Essen, once the heart of the industrial Ruhr, is Cultural Capital of Europe. 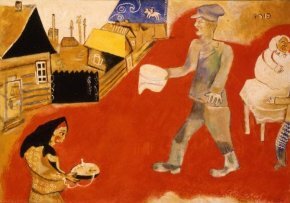 To mark the event, the Museum Folkwang has put on an ambitious exhibition, “The Most Beautiful Museum in the World.” Its aim : to reunite, if only for a temporary exhibition, the masterpieces from the museum’s collection sold by the Nazis and now dispersed among private collectors and important institutions the world over. The exhibition title is a quote from Paul J. Sachs, co-founder of the MOMA, when visiting the museum, in 1932, when Essen was considered one of the most avant-garde and adventurous collections of modern art in the world. To understand the importance of the exhibition, it is necessary to backtrack a moment. Karl Ernst Ostung, the young collector to whom the museum owes its conception, befriended the Brucker and Blauer Reiter groups, and bought regularly from Max Beckmann, Ernst Ludwig Kirchner, Karl Schmitt-Rottluf and Emil Nolde, Wassily Kandinsky and Franz Marc, as well as being one of the earliest buyers of works by Matisse, Cezanne, Van Gogh and Gauguin. On his death in 1922, his collection, held in nearby Hagen, merged with the Essen municipal collection, under the directorship of Ernst Gosebruch. He collected non-European art as well, exhibiting pieces from Africa, Papua New Guinea and the Far East alongside Greco-Roman sculpture and European painters. Gosebruch was forced by the Nazis to resign in 1933. His successor, Klaus Graf von Baudissin, a fervent sniffer-out of un-Germanic and degenerate art, removed no fewer than 1450 pieces from Essen’s remarkable collection. Some were sold, others destroyed. Many, including Nolde’s 9-piece Christ altar, were sent by him to the infamous Munich exhibition of “degenerate art” in 1937. The confiscated works, important paintings and many drawings, had a mixed fate. Some were sold quite legally by the German government to wealthy American or Swiss collectors. 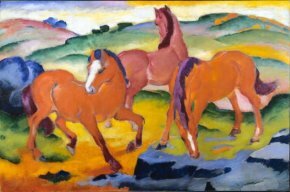 The most important ones to have been loaned to Essen for the exhibition are Franz Marc’s Grazing Horses IV, The Red Horses (ill. 1), now at the Harvard Art Museum, Cambridge MA, Chagall’s Purim (ill. 2) at the Philadelphia Museum of Art, and Kandinsky’s Improvisation 28, (Second Version), now part of the Samuel Guggenheim New York collection. As Henrik von Boxberg of the Essen Folkwang explains, “We have to wait and watch out for paintings in private collections coming up for sale. 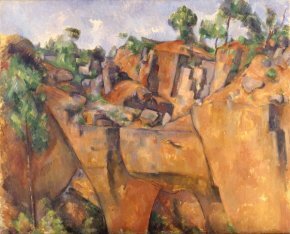 As the sales were legal, we aren’t able to reclaim them in anyway and of course, other museums are equally entitled to bid for them.” Among those successfully tracked down and bought back through auction in 1964 is one of Ostung’s earliest acquisitions, Cezanne’s The Quarry at Bibémus (ill. 3). 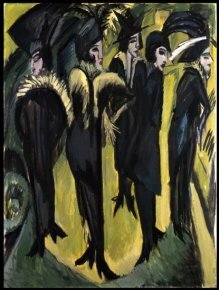 Ernst Kirchner’s Five Women on the Street (ill. 4), on the other hand, now belongs to the Museum Ludwig, Cologne. The fate of the museum’s two Derains illustrates how difficult the task of recovery is. Most of the legally sold works transited via a certain Kurt Buckholz who owned galleries both in Berlin and in New York. A 1913 Still life with bread and fruit of Derain’s was then purchased by a private New York gallery, where diplomat and businessman Averell Harriman purchased it in 1943. It remained with him until 1972, when he left his art collection to the National Gallery of Art, Washington. A second Derain, The Saltmarshes of Martigue, 1913, transited via three Swiss galleries, before being bought at a Sotheby’s auction in 1998 by the Lebanese Minister for Justice, Ibrahim Najjar. In both cases, Furchtwang Essen holds out little hope of ever hanging them permanently on its walls again, but reassurances from the museum have meant that they are both present in this temporary exhibition. The exhibition is set out by theme and alternates, in a clever wink at the original museum, European and non-European art, for the exhibition has also been an excuse its large collection of non-European art out of the cellars for cleaning and restoration. You move from a Matisse and Derain room to a darkened one showing Japanese theatre masks, or move from fragments of Coptic textiles to the Impressionists and on, via Sepik masks and Indonesian shadow puppets, to the Expressionists. The juxtaposition is logical. It is one that Emil Nolde had encouraged for his own works and personally collected Polynesian artefacts in the original gallery. The Museum’s new building, opened for this exhibition, is a succession of glass, metal surrounds and white walls by London architect David Chipperfield. All the paintings are lit through opaque glass roof panels. The rooms, which open out in such as way as to see parts of several rooms at once, allow the visitor easily to take in the exhibition as a whole. When you know a painting well, the impact of the lighting is striking. Take, for example, the Nolde Christ altar. When it was sent to the Munich “degenerate art” exhibition in 1937, Nolde wrote, demanding the work be returned to him in his interior exile outside Flensburg. It was returned, thanks to Goebbell’s intervention – in theory only state-owned work could be confiscated – and has remained in the hands of the Nolde Foundation ever since. I first saw it in the intimacy of Nolde’s Seebull home in Schleswig-Holstein. There, it covered an entire wall in a low ceilinged room jam-packed with smaller works. At the Nolde retrospective at the Grand Palais in the autumn of 2008, it was equally well surrounded and placed in an inner room with Nolde’s other religious works. Lit with warm lighting, the painting literally glowed. In Essen, set on its own against a white wall, lit from above with natural lighting filtered through opaque glass, the colours were harsher, the red and black suddenly dominating the greens and yellows. I had the impression I was seeing a different work. With such an emotional history attached to the exhibition, the visitor is naturally curious to know what never left the museum, what has been recovered post-war and what is forever lost to another institution. Unfortunately, the labelling is not always clear. It takes a while to understand that recovered works are labelled with date of seizure and date of return, while for those now in collections abroad, no date of seizure is indicated. A close look at the labels does however allow us to see what escaped confiscation. Apparently Gauguin’s Polynesian women were acceptable, as were some Cezannes, just depending on how Cubist they were. The list of over three hundred artists whose work was confiscated by the Nazis, but not the titles, is given at the exit. Details of the fate of each canvas are provided in the excellent 29 euro catalogue, well produced, but unfortunately only in German (as are the labels). Visitor Informations : Museum Folkwang, Museumsplatz 1, 45128 Essen. Open everyday except Monday from 10 am to 8 pm, until Midnight the Friday. Rates : 5.00 € (full), 3.50 € (reducted).